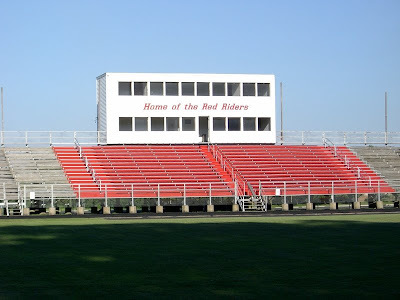 The Orrville Athletic Booster Club, in cooperation with the Orrville School Administration has completed the final phase of the $400,000 bleacher replacement project at Red Rider Stadium. 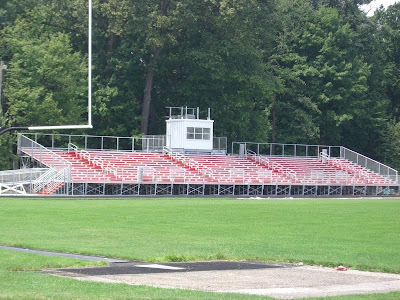 Beginning in 2007, the old visitor bleachers were torn down and replaced, complete with a new pressbox. Earlier this year, the north end of the home bleachers were replaced, and just in the past 2 weeks, the south end was completed. The result of the hard work and thousands of dollars worth of fundraising is quite impressive to see and gives the stadium an updated and uniform look. When compared to pictures of the old wooden bleachers, you can really appreciate the improvement that was made, not to mention how necessary this project was. Anyone that has been to a game in the past 5 years knows this all to well. Thanks go out to the Orrville School Board, Administration, AD & the Athletic Booster Club. What a great show of cooperation in working together on this project. Wonder what they'll think of next? Did BRF take a couple of those pics? We need to submit the new pics to the Ohio Stadium site now!